Normally this would be our “Friday Feature” post, but I was too busy being addicted to a certain weightlifting fairy show that I forgot to feature it. So here are the dramas Cornwall and I are watching right now! I’m not wrong about a skinny model pretending to be a weightlifter, and pretending to know what it feels like to be different from the molds of society. HOWEVER. Her pretending (er, acting, really) is so well done, that I don’t care if she doesn’t *look* like a weightlifter. Bok Joo’s personality is a HOOT. I’m 10 episodes in, and almost caught up. This is quickly shaping up to be my favorite drama of the year. It’s light, touching, hysterically funny, and self-reflective all in one adorable, Kdrama ball. Loving it! I waited all year for this one! I LOVE (love love love) Lee Min Ho, and I couldn’t wait to see him in a drama! I was even more thrilled to see him in something magical like this one, and playing opposite of Jun Ji Hyun in the role of a mermaid. Laaaaa! Magic! I’m finding myself wanting the story to just finish. 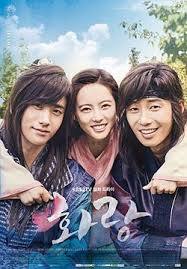 I have really enjoyed watching it, but I have to admit there is something missing from this drama. It’s not Lee Min Ho! He is absolute perfection, and actually, whenever he and Ji Hyun are together, that is when I love the drama the most. But everything around them is just a smidge off. I don’t know what it is, though. Maybe it’s the awkwardly done Joseon era flashbacks, or the fact that they are stretching an 8 episode plot out to 16. I’m not sure exactly, but it’s just not…there. I’ve enjoyed it for what it is, but I probably won’t be coming back to watch this more than once like I have with Lee Min Ho’s past dramas. Okay, I know there are mixed reviews out there on this one, but I LOVE it. Cornwall isn’t as into it as I am. And I can see why, honestly. It’s a little on the slow side–tons of screen time is devoted to close-ups of their faces, while they watch each other, and that gorgeous OST plays in the background. And much of the conflict (actually, almost all of it?) is internal conflict. So it’s a lot of them talking and thinking. It’s still too early into the series for me to make any calls on this one. But it’s turning out to be pretty much exactly what I thought it would be. Fan service! We’ll see how this one goes! So there you have it! These are the dramas we are currently watching, and I have to say, I’m impressed with how many really good ones are out right now! Usually I only have one or two current dramas in rotation because I end up dopping them at some point. Not this line up! They’re all really well-done, and the creativity is of the charts. Thanks for stopping by, K-Fans! If you haven’t yet, check out our book. The more K-Fans we have commenting and expressing interest in the book, the better chance we have of getting it published so you can read it! I’ve been just WAITING for Viki or Dramafever to take more episodes for these shows off Premium so I can watch them. The premium thing is such a bummer! I subscribed because I’m too addicted not to, but I still remember the good old days when it was all free! I love Goblin! I’m slowly catching up on Weightlifting Fairy Kim Bok Joo. 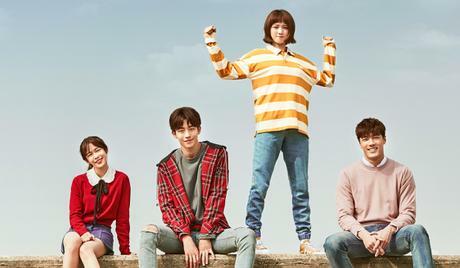 I watched all of them except for the Weightlifting Fairy Kim Bok-Joo.. one episode left for the Legend of the Blue Sea. Hoping for a happy ending. You and me both! I feel like they did set it up for a happy ending, despite the doom and gloom they are projecting. We will see!